VIFC Meeting- Chocolate! – Food. Boom. 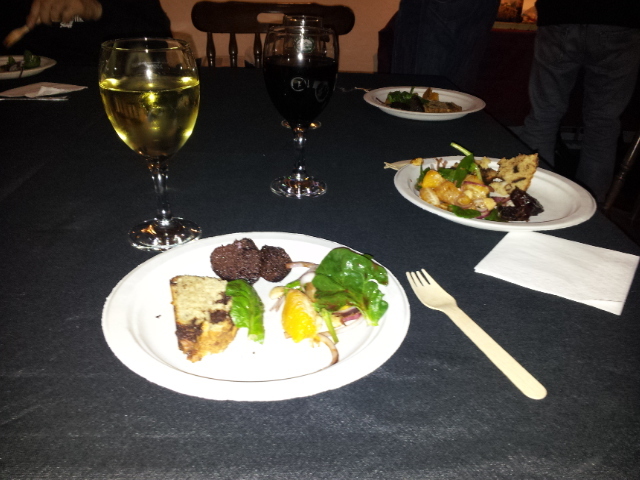 As I have hinted of late, I have been fortunate enough to get a seat at the table of a little group of foodies who gather in the upstairs room of The Victoria Inn in Colchester for the discussion (and inevitable consumption) of all things edible. Each week a theme is set and by wild card allocation you show up with either a starter, main course or dessert to fit that theme. 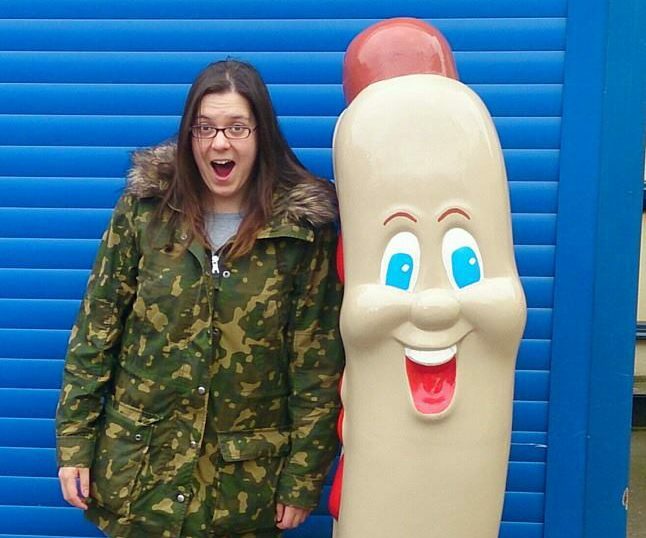 My first outing to food club was an enjoyable success despite my own near on nervous breakdown in the days prior. Me? Take something as simple as cooking for other people too seriously? Never! Although I will share in full my own dubious contributions to the group here, there wont be much access to the recipes of others for now, as we hope to put together a charity cook book at the end of this year. Obviously I will flood you with the opportunity to purchase this once it is available! But hopefully you might find some inspiration, or revulsion, or just say oh, right, and skip to the next post. Whatever. Enjoy! Victoria Inn Food Club April Meeting- Chocolate! Yes the theme for this meeting was chocolate, an easy brief to meet until you realise that in your absence last time you were allocated a chocolate based starter (thanks Tom!). But more about me later, below are the offerings of all. 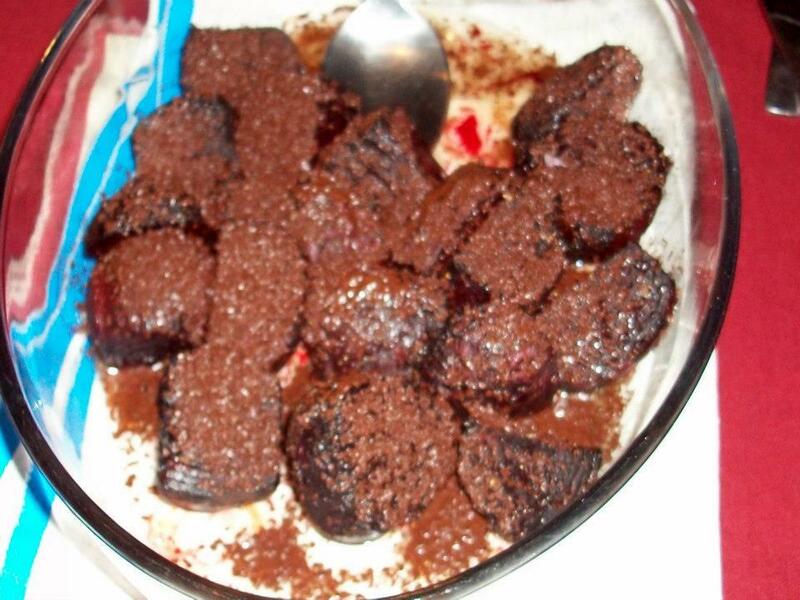 Roasted Beetroot from Ian, served sizzling hot dusted with chocolate and a wee pinch of salt. Sweet and scrummy and has me now thinking of ways to tart up an old beetroot chutney recipe with some cocoa. 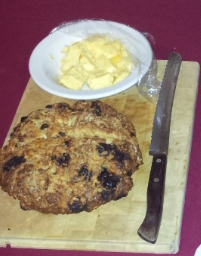 Goats cheese & parsnip bread with chocolate chips from Nicola. OMG. Food like this is one of the reasons I don’t have a bread maker. Amazingly moreish, stodgy and satisfying I could, and would, eat this until I literally bust a gut. Fabulous, I will be attempting this myself at some point. 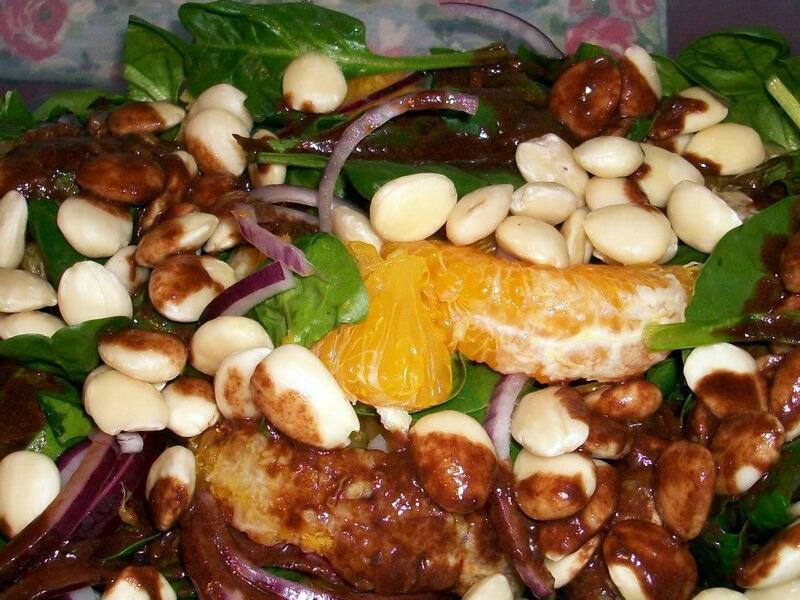 Orange and almond salad with cocoa dressing, from my good self. Well I liked it and no-one complained, so I’ll declare this a success. Full recipe in the next post. 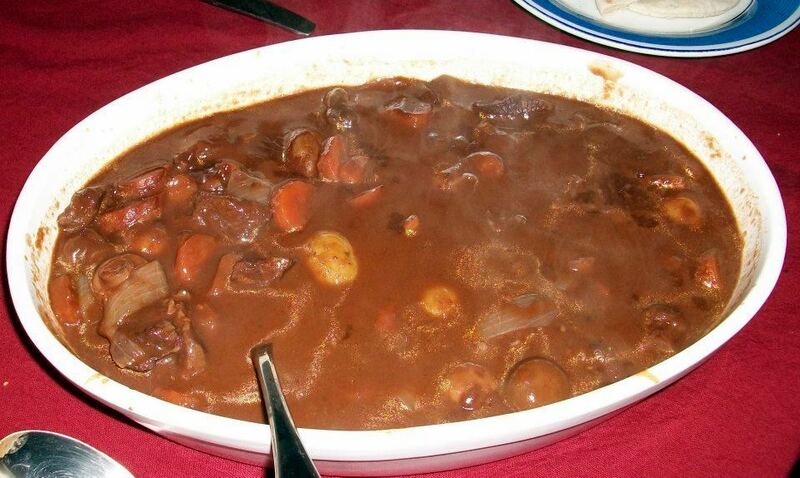 Chocolate beef bourginon from Tom. Mmmmm. A traditional start spiked with dark chocolate and chilli, wonderfully rich and the chocolate gave the liquor a gorgeous, glossy finish. Yummo. 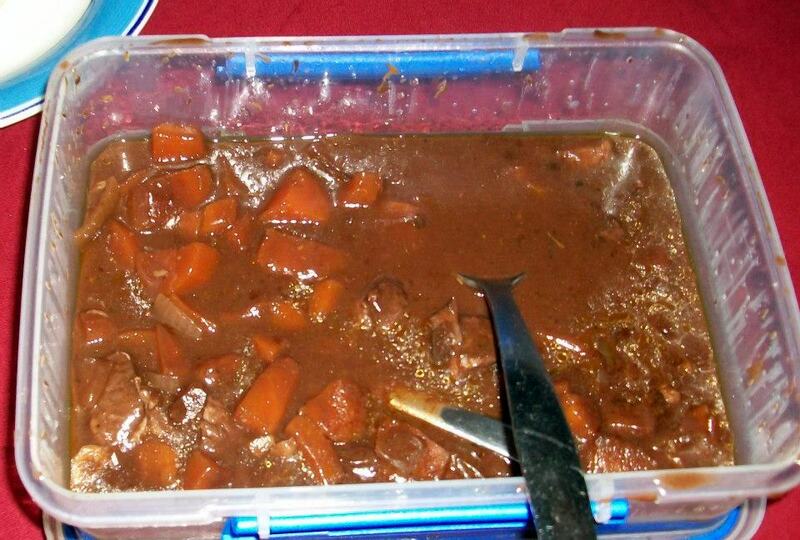 Venison stew with veg and, yes you guessed it, chocolate! This one from Amanda. Again a lovely dark base made rich with chocolate to compliment the gamey meat, very tasty. 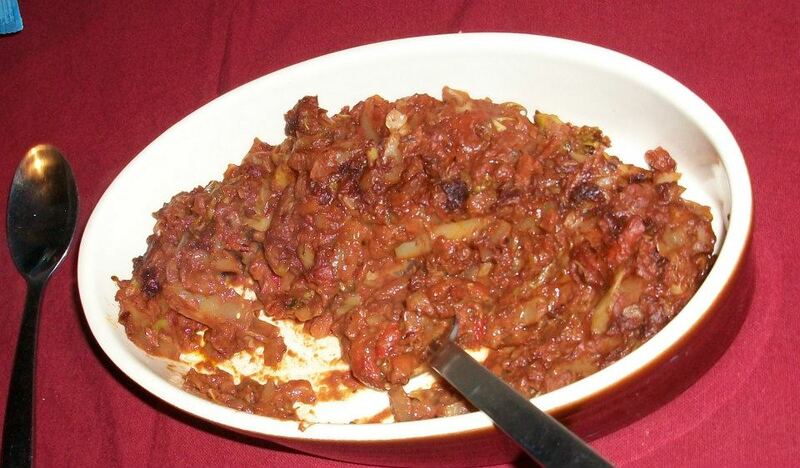 Vegetable curry with chocolate and coconut. Yes you read that right, coconut. And I ate it. And I enjoyed it! No seriously I did, mainly because I couldn’t quite single out the coconut and if we were doing a blind taste test thing I would never have picked it out. This was a lovely, sweet and warming dish and Paula gets a medal for coming up with something that I would eat again, despite knowing it contains the dread coconut! Aaaaargh!!!!!! 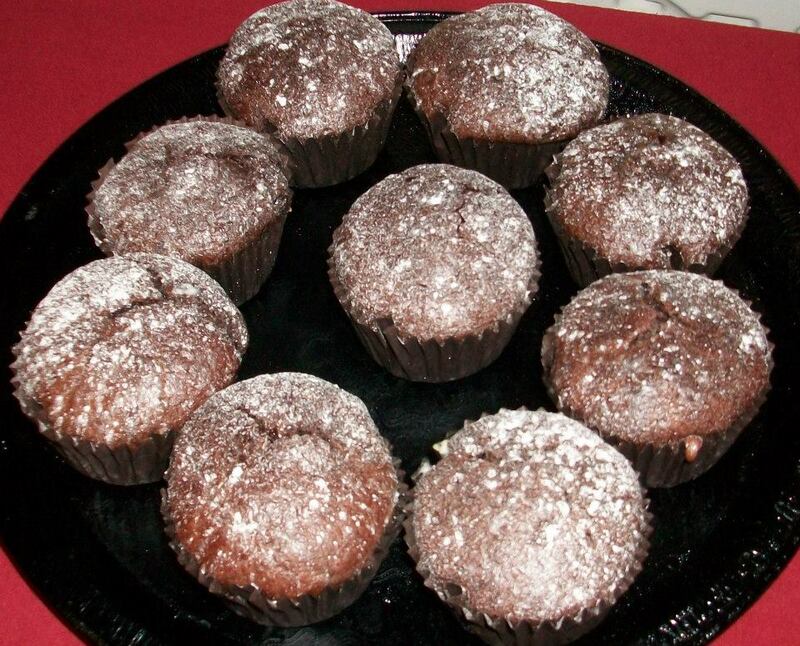 Chocolate muffins with a white chocolate centre. Thank you Sheena for ensuring we could have our cake and eat it! These were delicious and light, apparently some freezing was involved in the process which I shall research more and hopefully implement in my own baking going forwards. Scrummy. 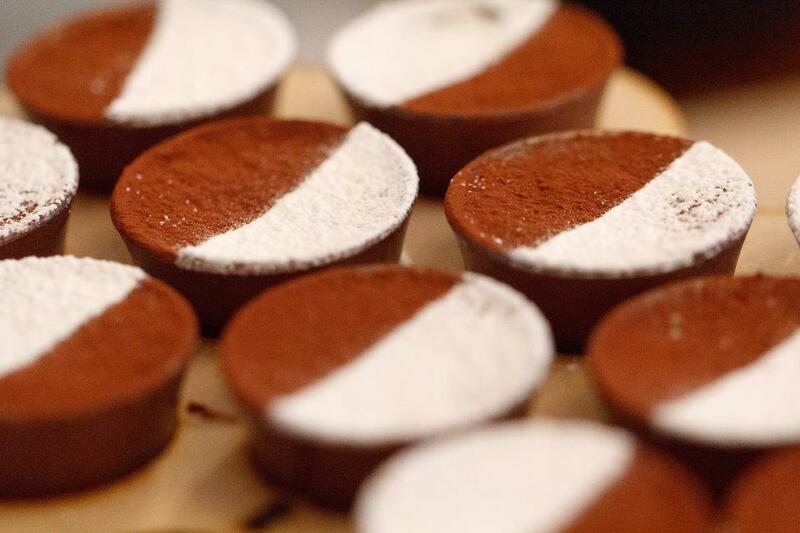 Rich chocolate mousse shots from Matt. It may seem a teeny tiny portion but ye gods you don’t want more than this. Evilly rich and gloriously presented, a really naughty treat to finish a night of naughty treats. Chocolate Bread & Butter Pudding. It seems that Matt is more than a one trick pony, so to speak as he doubled up for this meeting and also brought along this. 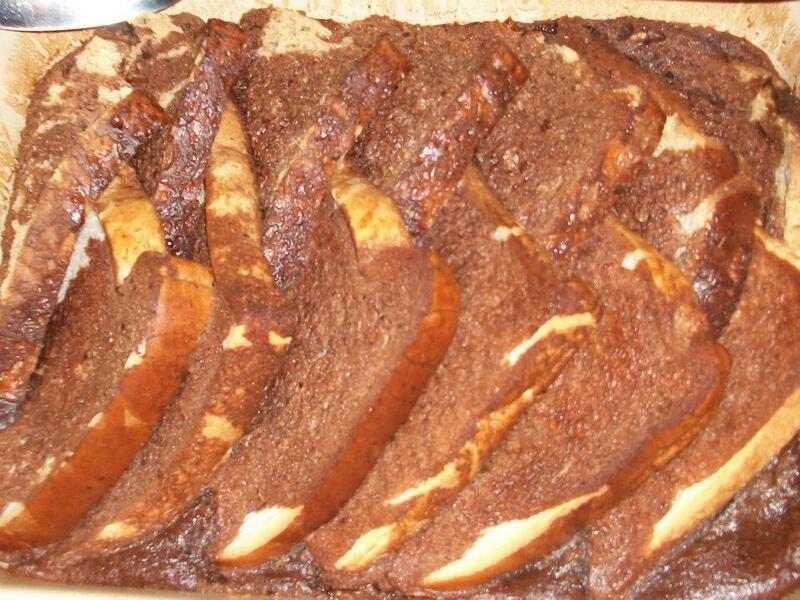 No fruit or messing about, just bread baked in a chocolate custard. Heavy duty man food and no mistake. Good stuff. 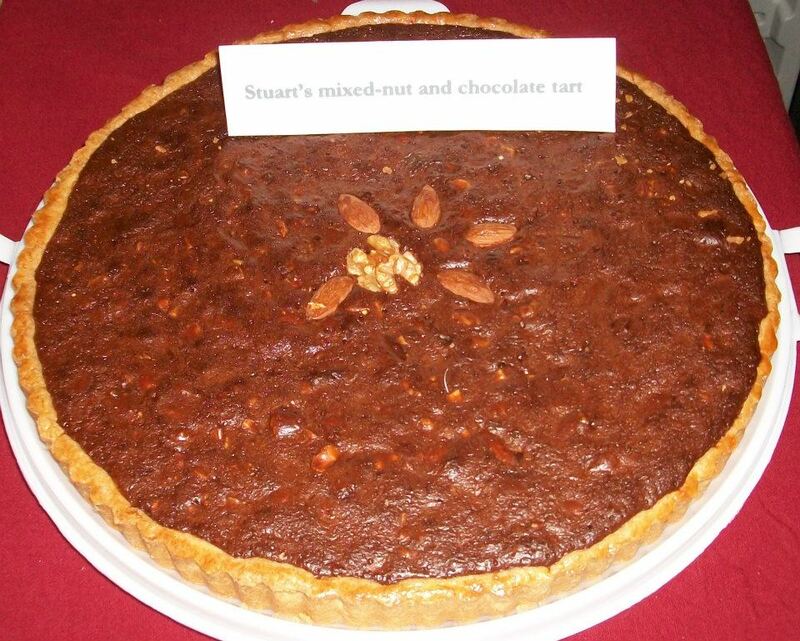 The chocolate and nut tart, from Stuart. Apparently this dish had it’s debut for Stuart’s sister at Christmas. Crunchy with nuts and cheeky with rum essence all wrapped up in a squidgy chocolate base with a shortcrust pastry shell. I think it will be back by public demand soon. Safe to say, this was not a dinner meeting suitable for any diet plan ever, unless you’re trying to fatten up for an upcoming movie role! Everything was enjoyed thoroughly and if I had to pick a winner for the night my vote would go to that fabulous bread from Nicola. Divine. Waddling my way home I decided that the evening was more than a fair trade off for some extra gym hours and thanked the God of waistlines that we were going in taster portions as I probably would have gone a full plate of most of them and just ordered a wheelbarrow home. But my self control around the culinary delights is well documented so I’ll leave it there. several photos stolen from other group members, thanks for that!